Be the scariest mummy outside of Egypt in this Adult Mummified Costume! The jumpsuit has folds that look like bandage strips, and the mask is painted & molded to look like a skull with rotting flesh and hanging bandages. If you want to make your own horror flick, this would be great! They say that if you mess with a mummy's coffin you'll get a curse. I don't know about you, but I didn't wake this mummy! Moan your way out of your crypt in this Adult Mummy Costume. What does every Monster Mash need? A mummy! Now you can be the coolest guy to come out of the hot desert with this Adult Mummy Second Skin Costume. The greatest thing about this costume is that you just have to slip it on to become a mummy instead of having to spend hours wrapping yourself with those pesky bandages. So, happy haunting to you this Halloween in this spooky mummy costume! Being dead doesn't have to be ALL bad. Mummies seem to be having the time of their lives, now that they no longer have to worry about being alive. They get to spread ancient curses on people who make them angry and since they're basically Pharaohs who became zombies, they're kind of like the king of all zombies. We could go on about how cool mummies are, but why not just let your kid give it a try? This Boy's Mummy Costume lets your child live out the life of a mummy for a day! is your kiddo looking to channel some old school Egyptian terror? The mummies won't be trapped in the pyramid anymore when they have this mask. Complete with fabric mummy wrap, you can add a simple costume and they'll be giving pharaohs a fright all night! You probably wouldn't be thrilled, either, if someone disturbed your rest after two and a half millennia of repose! So it's no wonder that this Child's Pharaoh's Revenge Costume gives a totally creepy look. It's great for a horror or Egyptian theme event. Revenge can be sweet! Some say she's just a legend... but we know the truth. The mummy lives! And she's possibly in your house right now eating cereal at the kitchen table, or she might even be up in her room on studying up on reading and writing (written word is waaaay more complicated than hieroglyphics). Whatever your girl is up to, when she's in this mummy costume, she'll be guaranteed to have a great time! 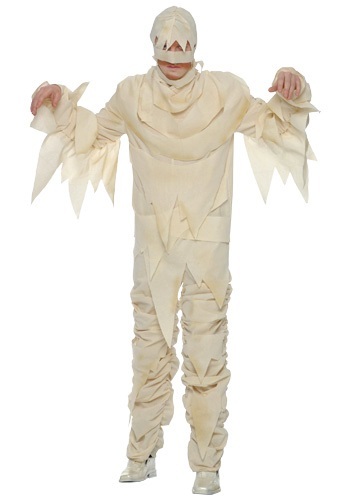 Don't let her fret about her costume this year, she can have it all with this Mummy Costume! With the perfect combination of cute and scary, she'll be able to trick or treat, have a ball at her little costume party, or even make a Mummy inspired music video. She has been spending her free time working on Egyptian dance moves, right? If you're ready to get out of the the sarcophagus you're going to want make sure that you have the right threads, and this costume will provide the perfect look. 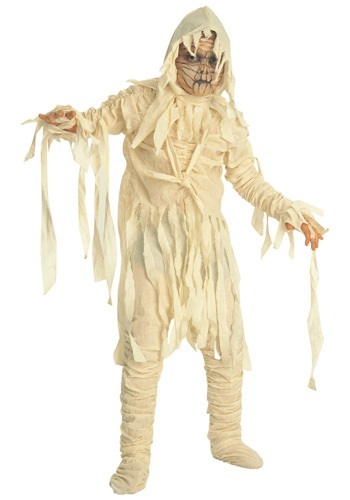 You'll really be able to terrify the neighborhood with this mummy costume! It's an exclusive look you won't find anywhere else. It looks ragged, but don't worry, it's supposed to! Say hello to your "baby mummy." Sorry, we just could resist a little bit of cute word play after seeing this adorable costume for babies! It comes with all the freaky curse aura of a normal mummy costume, but it's in a size that your little pint-sized cutie can wear. When we started uncovering mummies and sarcophagi in the nineteenth and twentieth centuries, stories of the mummy's curse began to rise. That's when the mummy entered popular culture as a horror figure, and our women's mummy girl costume is designed in that horror tradition. 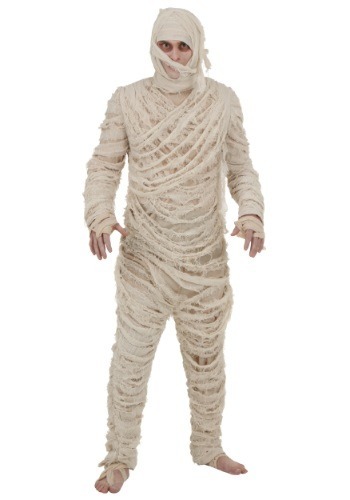 Don't become unraveled, because you can't go wrong with a mummy costume for a classic Halloween look. Disturbing the ancient tombs of the Pharaohs is a dangerous proposition. If you manage to make it into the treasure chamber, chances are a monster mummy will come back from the dead to exact a fate upon you worse than death. The situation is a lot more fun from the perspective of the mummy, which is now completely possible with this getup. It's perfect if you want to be the one doing all the cursing! Mummify your baby...well not really! Now you can give your tiny baby a costume that is both cozy and unique when you wrap your bundle of love in this Murphy the Mummy Newborn Bunting. This is an adorable costume that will keep your baby warm while looking festive! If you'd been hanging out in a casket for thousands of years, I think you'd be a little moodier too. But you have to admit, she does look pretty good--especially for taking a turn to the dark side. 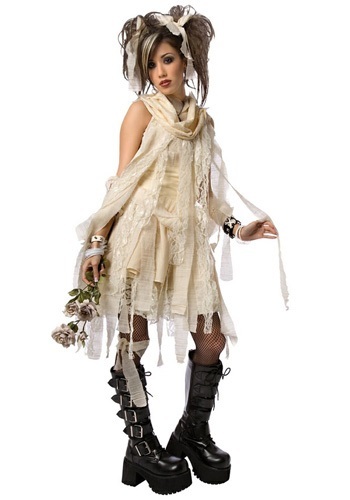 Come back with a darker style in this Plus Size Gothic Mummy Costume. In Ancient Egypt, there is a legend told generation after generation of the pharaoh who tried to party for two weeks straight. He made it to eleven days after his Sphinx was completed, but he went without sleep, and in that time he only consumed beer and a few handfuls of corn nuts. Suffice to say, he didn't make it. But, his legend lives on when you wear our Plus Size Mummy costume and continue to party hard for all of Ancient Egypt! Rise up from the dead, grab a brewsky, and show the 21st century that the ancients knew how to get down. But get some sleep and eat more than corn nuts! Be the cutest girl to ever emerge from any tomb in this Teen Mummy Cutie Costume! Add white shoes to complete the look, and mummy makeup to be even scarier. Time to wake up and see what's happened in the last few thousand years! Rise from your grave and walk the streets in search of a good party! 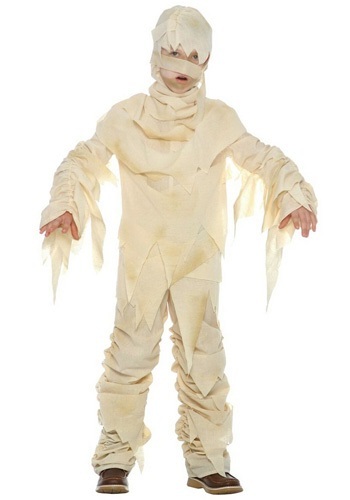 In this teen mysterious mummy costume you can instantly achieve a ghoulish look while remaining cute and comfortable. Deep in the tombs of Egypt there is an ancient ruler who is in a deep slumber. But when that sleep is disturbed the curse of the mummy is activated. What does this curse entail? A lifetime of a bandaged skeleton haunting your every waking moment. Now your little one can become the scariest monster of the desert in this costume. There's no sign that the zombie craze is ending any time soon, but can we all agree that there has already been a zombie craze in the last century? Of course, we're talking about the mummy! He's the original granddaddy; the biggest, baddest, most ragged and scary zombie of them all. 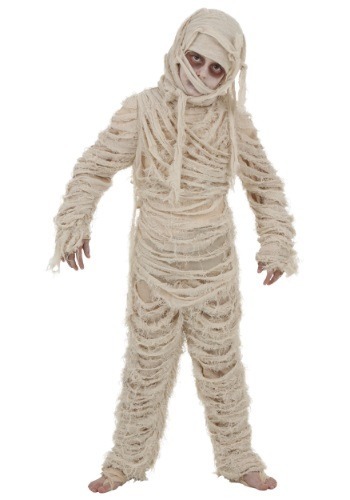 If you're the type of parent who just loves to bring back a classic, then this toddler mummy costume is the way to go. It has so many great details in the fabrics used to make it an incredible blast from the past. Not to mention, totally spooky. 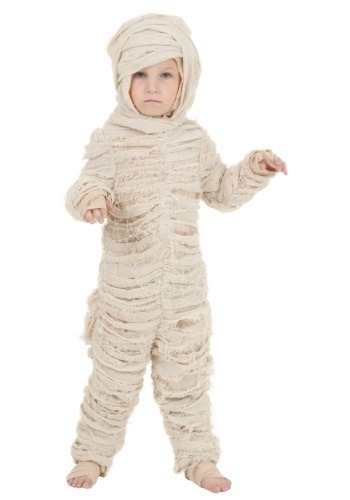 Your toddler can grunt and howl his way through Halloween and become the freakiest of the undead on the block when he wears this exclusive mummy costume for toddlers. 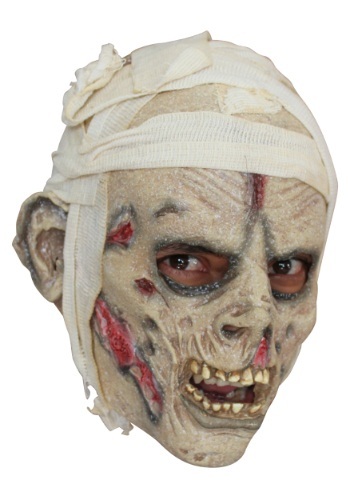 This Women's Mummy Dearest Costume is perfect for a horror-movie theme party! Add makeup & strappy sandals to finish the look, and practice your sideways walk. This mummy has returned from the tomb to find some new victims. She's looking for more people to party with! With this look you won't have any trouble finding people who want to dance with you on top of the Pharoah's sarcophagus. No one is going to fault you for tearing up the dance floor because everyone knows mummies have the best time. Have a blast like it's 1300 BC with this Mystical Mummy Costume!